I'll try to explain what I mean. I love playing Dragons, but I hate Priest and so.. I like Pirates but hate Warrior. So you get the theme of my post. 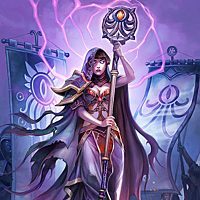 Why can't Team 5 design theme cards that are viable for every class instead of just one. Dragons should not have a class preference imho and neither should pirates or murlocs etc. Is there a reason for this that I am unaware of? It's mostly so that each class gets to have an identity and we don't end up with each class feeling the same. Pirates are primarily flavored in Rogue and Warrior while Dragons is Paladin/Warrior/Priest. I could see doing Dragons in another class at some point, they are pretty cool.